First of all I apologize to Taverngoers for not getting this up earlier – there was a mix-up in Tavern planning. I was under the impression someone had already taken the recap but it turns out no one did so I’m gonna put this up as fast as I can. My bad guys! Anyway, here we go! P.S. many of you may be wondering why nothing about the Suwon U17 Cup is up – I’m working on a composite post that will be posted after the Brazil match in two days. After not only beating Myanmar 2-0, on GK mistakes at that, I really didn’t have high hopes for this match. What made me even watch this match in the first place was the starting lineup. What I was most happy with was seeing a 4-1-4-1, the lineup I’ve espoused for the KNT for a while (either that or a 4-3-3). We obviously don’t need to play two CM’s (DM’s) playing against teams like Laos, so I was glad to see a shift away from the 4-2-3-1. 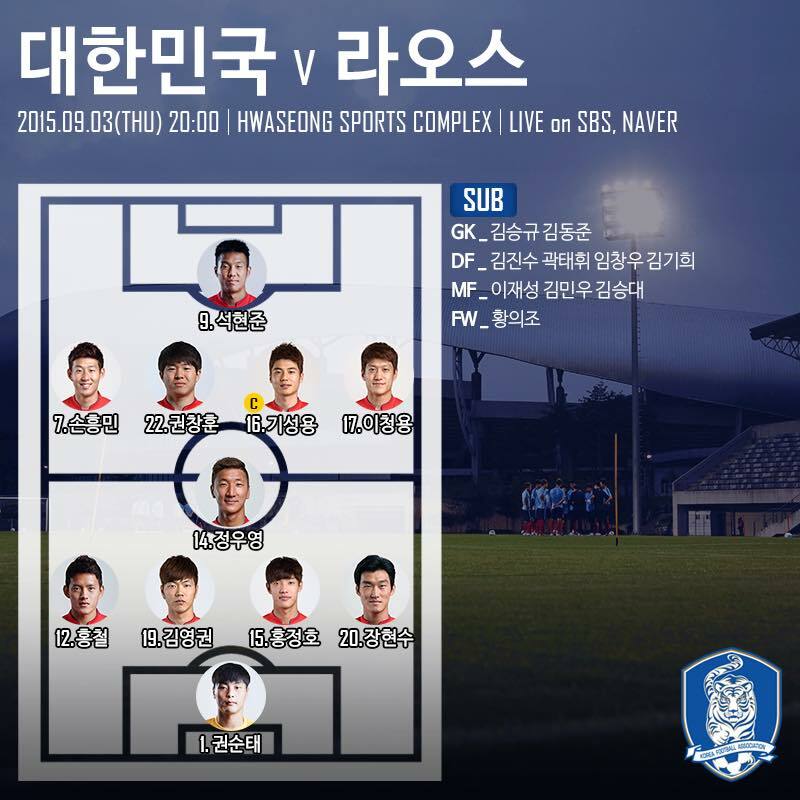 Hong Jeong Ho in the starting lineup. Now this is Laos and tbh who we played at the back wouldn’t have made too big of a difference, but I was glad to see Stielike acknowledge HJH’s renaissance with Augsburg. Ki Sung Yong in a more attacking role. KSY’s talent’s go to waste if he has to defend all the time. Now, even as a DM, KSY’s the best player we have (if only we had multiple KSY’s) but we have seen time and time again his talents truly shine when closer to the opponent goal. Suk Hyun Jun. It was inevitable that he was going to play due to his form and the fact that SHJ and Hwang Eui Jo are the only strikers we called up, but I was really glad to see him finally play (should’ve been called up much earlier). I was just as happy to see K League joint top scorer HEJ come on as a sub. More on the two strikers later! Kwon Chang Hoon partnering Ki Sung Yong. After seeing KCH’s unique attributes during the EAFF Cup, many fans have wondered how a KCH – KSY pairing would work out. More on that later too! Kwon Sun Tae. The man’s probably the most in form keeper in the K League at the moment and it’s about damn time he got a callup and some playing time with the national team, even if he’s on the wrong side of 30. Hong JH + Kim Young Kwon. Now we haven’t seen this one since the 2014 World Cup – it’s been more than a year, and we all know it didn’t work out. KYK has remained more or less the same since, but he’s learned to tone down his KYK-esque brainfarts. However, I feel that Hong JH has evolved quite a bit since starting regularly for Augsburg. He’s more aggressive; his tackle timing, decision making, and abilities in general seem sharper than before. We should be very glad he’s healthy again because the last time I remember HJH being 100% fully fit and hitting the pitch regularly was in 2012 pre-Olympic-medal-chances-screwing-leg break. Jang Hyun Soo as… RIGHT BACK? Stielike PLEASE. This man is a CENTER BACK. He has exceled at the role for all youth levels. First a CB, then a DM (Choi Kang Hee it was YOUR idea…), now a .. RB? Despite the opposition we really couldn’t just play Lim Chang Woo? As you may have expected we dominated pretty hard. Laos didn’t pressure much at all, opting for defensive shape over pressuring. Despite our dominance Laos did have the occasional moment or two, with some nice strings of passes going around, though their offense was more or less nonexistent. A lot of times their strategy was take the ball, punt it as far as you could, and hope someone would receive. Once or twice someone did receive. But more frequently, there was either no one there or a CB got to the ball much faster than the onrushing FW. 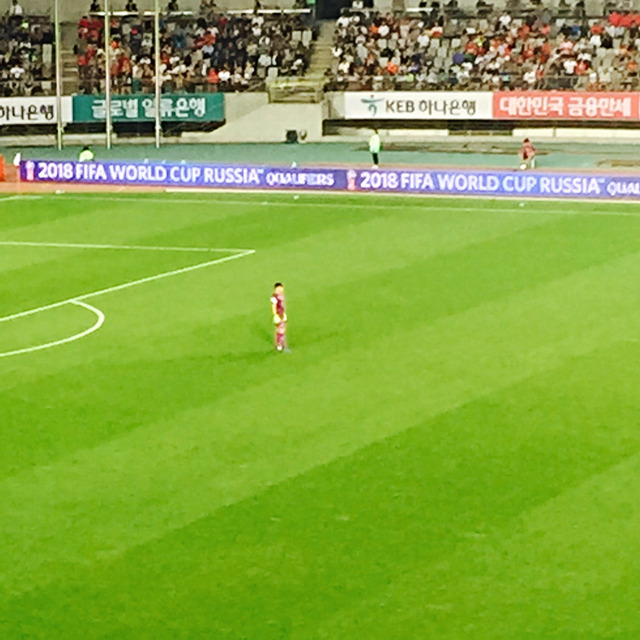 A minor cringe moment for Korea came early: remember how Kwon Chang Hoon couldn’t take set pieces to save his life in the EAFF Cup? Well let’s add SHM to that list. He was never that good at corners but today there was a very funny moment where he made a short pass from the corner spot but… his pass fell straight to a Laos defender. I think even I wouldn’t have made that kind of mistake. He also kinda screwed up a conventional corner in the 41st minute, because his corner went just in front of the keeper who easily punched it out without even having to rush out much. That aside, we scored fairly quickly for Korean standards in the 9th minute. Hong Chul burned a defender with nothing but pace (seriously, he kicked the ball far out and outsprinted the defender), crossed to Lee Chung Yong, who finesse’ed a header into the net from a fairly hard position. And 3 minutes later 가레스 홍철 recorded his second assist of the day (click on the link, the gif won’t embed for some reason). SHM finished it off nicely but let’s be real, that would never work in the EPL. And our dominance just kept going this way. I especially liked how fluid we looked in attack. Players overlapped and switched positions a lot. And most shockingly, PLAYERS ACTUALLY MADE RUNS BEHIND THE DEFENSE, something basic that has surprisingly been lacking from the KNT for quite a while. Even Ki Sung Yong was looking to penetrate the defense, something we have not seen from him on the KNT since… forever ago. It was quite refreshing to watch. Don’t celebrate just yet though. Our opponent was Laos. To be honest, I can sum up the entire second half with the GIF’s of the goals. Because it was more or less the exact same business, but with 5 more goals. Well it was a feel good win right? The last time we on by any big margin like this was back in 2011 when PJY just signed for Wengerseki and scored a hattrick in the 6-0 win vs Lebanon. For the first time I don’t have complaints. It felt refreshing, especially after the Myanmar near-debacle. We still however, learned somethings from this match. 1. Can Kwon Sun Tae can make it on the international stage? Due to his age alone, I’m afraid he doesn’t have a long term future on the KNT, but I would’ve liked to see him at least tested. This man didn’t have ANYTHING to do vs. Laos. I don’t think the TV camera even panned to him more than 4 or 5 times. 2. Is the Kim Young Kwon – Hong Jeong Ho partnership viable? For like the 10000000th time, KYK and HJH are too similar players to work together. It’s very cliche, I know, and the accuracy of that as applied to now should be questioned. It was certainly true in 2014 because we saw that they couldn’t cover for each other’s shortcomings. But with Hong’s resurgence at Augsburg and KYK’s building of experience can it still work? Can our two most talented CB’s still make it together? We’ll need harder opposition to see. There’s a friendly vs Jamaica in October (just announced today by the way) but… I mean when are we going to play UEFA teams? We need to judge how far we’ve come under Stielike. 2. Kwon Chang Hoon and Ki Sung Yong – it was hardly a test but I liked what I saw. As expected, their very different styles complemented each other pretty well. I would like to see this duo again vs. Jamaica. 3. Hwang Eui Jo vs. Suk Hyun Jun – the ultimate question – Now both strikers were pretty good, and I am hesitant to recommend one over the other. SHJ showed drastic improvement since 2010 and he’s clearly got skill but he must be learning from Lee Dong Gook or something because his movement was subpar, leading to him not getting as involved as he should have. On the other hand Hwang EJ was much more involved, more aggressive, and had better movement. He looked slightly better imo but 1. the defenders were VERY tired and 2. he still couldn’t score despite all the space they gave him. Who will start next game? I expect HEJ just because SHJ started Laos, but who knows. I imagine we don’t get many Euro opponents because of timing and distance. We’re in WC/AC qualifying. UEFA teams are in Euro qualifying. Obviously can’t schedule matches against each other if it’s a qualifier, and when there are spare dates like next month the Euro teams (if they have a spare date too) don’t want to fly their squad to Korea (and Korea vice-versa). The result is we end up with other AFC teams or CONCACAF teams that are willing to take the paycheck to come here.